Sometimes not knowing when to give up is a good thing. My brother Bruce and I headed into Albany, Ga., on December 11, 2014, as part of a recent trip from New Jersey to Florida. 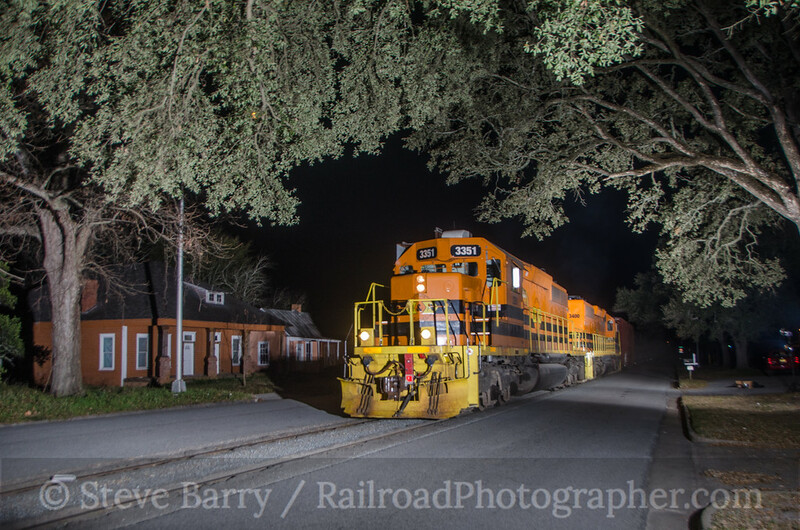 Our goal was to get a night shot of a train on the street running in town. I had seen photos of Norfolk Southern freight trains heading down Roosevelt Street and thought it would make a nice night shot. Trying to find information on when the trains ran proved problematic. We checked at the NS yard office in town, but no one was around. Suddenly a train pulled out of the yard and headed towards Roosevelt Street. 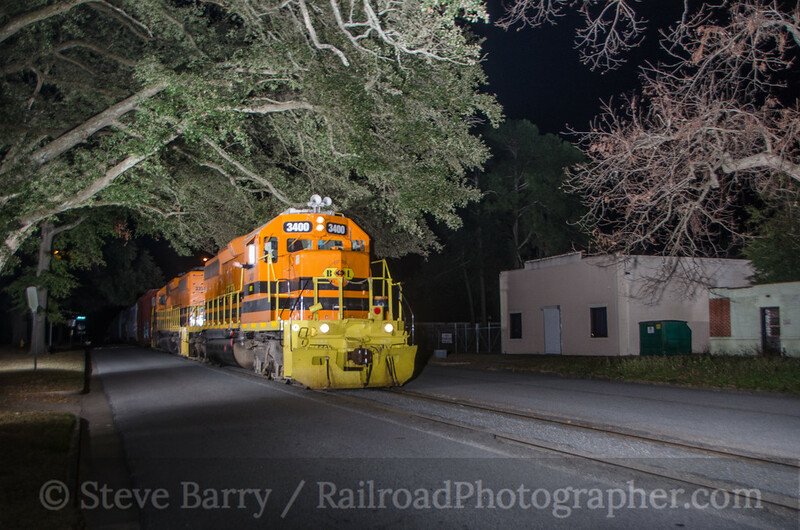 We quickly got ahead of it and set up our strobes in record time -- only to have the train retreat back into the yard, never to be seen again. Still without good intelligence on when trains ran, I set out on foot looking for a local. My search was quickly rewarded when I found one of Albany's finest in his cruiser about a block away. Certainly the police would know if trains ever used the street running at night. My inquiry (strange as it was) was met with a rather certain reply -- "There is a westbound train every night at about 11:30." Since it was only 8:30, we settled in for a long wait. Now for a little background. The previous night we had also been set up on street running, this time up in Augusta, Ga., where we had a real nice shot of the history museum at the north end of 6th Street all set up. The local people told us trains went down the street "all the time." Alas, from the time we set up at 7:30 until we called it quits at 1:45 a.m., we didn't see a train. Waiting on street running in the dark was becoming a recurring theme on this trip. Now, since this was a shortline running to an interchange, there was a good chance it would turn back once it completed its work in town. Bruce drove to the yard a couple of times while I stayed behind to watch the photo gear to make sure the H&A crew didn't go home. The locomotives had left their train and coupled onto another string of cars. A little past 3:00 a.m. the train headed back west again and we got our second shot. Now it was 3:15 a.m. We tore down our strobes, packed the car and stumbled into a motel a bit before 4:00. We were tired, but we got two night shots for our efforts. And it was of a railroad neither of us knew existed before it showed up in our cameras. There's a fine line between persistence and not knowing when to quit -- and sometimes not knowing when to quit pays off!